General SQ General discussion of Sound Quality related issues. Most people are familiar with a graphic equalizer. This type of EQ has a number of bands at set frequencies that you can adjust the amount of boost or cut at. A parametric equalizer lets you choose or move the frequency that you want to affect. This is the center frequency. All EQs affect not just the frequency indicated but also those around it. Think of it like a mountain - some are narrow at the base relative to the height and others are wide at the base relative to the height. 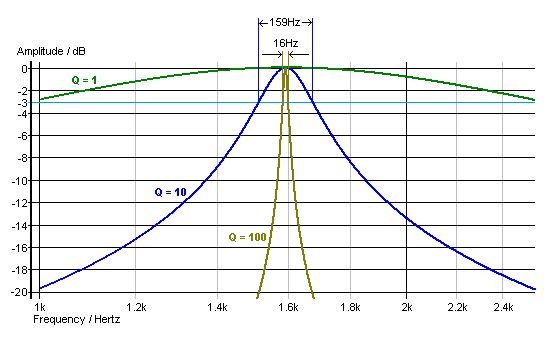 Those EQs that do not affect much around the center frequency (narrow base) are said to have a Low Q and those that affect a bunch around the center frequency (wide base) are said to have a High or Wide Q. Most parametric equalizers let you choose how much Q you want. Generally parametric EQs are seen as superior to the graphic type. In the car environment there is often a need for both a sharp narrow correction in one part of the frequency spectrum and also a wide gradual one at another. A parametric EQ lets you handle both. This is about the best picture I could find on google images. The lower the Q number, the more it affects the surrounding frequencies. In this image the center frequency is approximately 1.6k (or slightly below that anyways). Does this help at all? ok let me know if I got this right. Center frq is the frequency I want to affect and q-factor widens the frequencies around the center frequency so I'm playing with more then just the selected center frequency? So it all depends on what I like ? or do some frequencies need more "boosting" then others? if so what do most people go for? What frequencies all depends on what you prefer. Are there certain frequencies that sound harsh? ones that hurt your ears? Ever hear a symbol crash that your speakers just cant handle? These are a few things I usually look for when adjusting. I find myself bringing frequencies down a lot more than I bring them up.